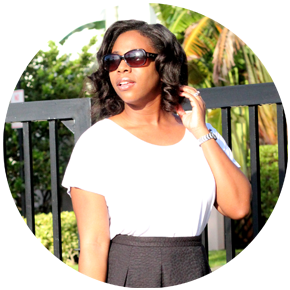 My Garments of Praise: Let's Discuss // So you dress cute, what else? "So you _______, but what else?" "So you thrift, but what else?" "So you like make-up, but what else?" "So you have natural hair, but what else?" "So you sing, but what else?" I participated in a blogging webinar a few months ago that provided so many helpful tips, but there was one thought that I did not agree with. The presenter was talking about how to develop a strong following on Instagram and basically said to stick to the topic you blog about on social media as well because that's what your readers follow you for; and while your followers might tolerate the occasional food post if you're a style blogger, they don't want to see photos of your kids. My first thought was, "That's funny... It seems like the only photos my followers want to see from me are photos of my kid!" (Seriously – check my Instagram. My son runs the show with 80+ likes minimum on a bad day while 80+ is the max for photos of me. And I don't mind it one bit!) While I understand and agree that it's important to promote a main focus if you're a blogger or have a consistent message to convey / image to maintain, I personally prefer content from people who show that they lead balanced, positive lives and have real life goals and inspirations outside of what we, the content consumers, know are a "given" from you. Do you work? Do you travel? Do you spend time with family and friends? Do you have fun? Do you read? Do you pay attention to the news? Do you strive to make yourself and others better? Do you serve God? Do you have goals? Do you have values? Do you get inspired? Do you inspire? Outside of fashion, food, hair, music, preaching or whatever it is you post about constantly, do those who follow you get a balanced sense of who you are? If you've noticed, the public is even requiring celebrities to be more genuine and transparent online and on social media. Celebrity brands are becoming more about who the celebrities are as real people instead of what they can offer in terms of their talent. The new trend is for websites of well-known actors and singers to take on the form of blogs rather than the traditional, non-fluid website. Two quick examples of celebrities whose content I enjoy are Tracee Ellis Ross and Tamara Mowry. My Garments of Praise is primarily a personal style blog, but I had to work on making it clear to my readers that it is much more than that. My "garments of praise" are more than what I wear. I have a family, a career, interests beyond fashion, and most importantly a love for God. Although I'm naturally a very private person which is one of the traits I admire about myself, I value balance and sincerity, and what better way to show that than through the content I share. So, if you're here for the personal style posts, thank you. I also invite you to bear with me when I write about lifestyle, prompt discussions, and frequently post photos of my son on Instagram. Those things aren't going to change. Is it just me, or do you also like to share and consume balanced content online and on social media? What are some of your passions and interests beyond what you've become known for on certain platforms? Feel free to share in the comments section below, send me an email, or join the discussion on Twitter or Instagram. Great post! I am in agreement with you, I enjoy seeing various content from those I follow on social media, specifically instagram. Whether it's posts regarding family, traveling experiences, current world issues, religious views, etc. it all helps me to somewhat "get to know" the person behind the style pics, make-up pics, etc. it also allows for a deeper connection to your audience. Funny you mention your son steals the show. The posts that generate the most likes on my instagram is anything wedding related. My followers love Love apparently..lol! I definitely think it's important to possess more than meets the eye. Yes, I love fashion but I also am a loving wife, devoted christian, graduate student, career woman, wedding planner, dog lover, etc. Balance is so necessary! Keep up the awesome blogging my friend! FYI..........I shared this on Twitter & Facebook! I'm no blogger, don't think I ever will be, but I will share some interests I have that you may not know about ;) I love to read! I’m particularly fond of real-life or fictional legal stories. Surprisingly, I liked this genre of books long before I considered working in the legal field. I love to cook however I critic my food to a point where I'm very nervous about what folks think of my cooking so I only love to cook for my Hubby lol I can easily follow recipes and love to try new things in my own kitchen as opposed to at a restaurant. I one day hope to take a cooking class. I love to try new foods. My favorite cuisines are, Greek, Thai, Italian, Chinese, and Japanese (mostly for the sushi). I love to travel, whether by road, air or cruising. Cruising is my absolute favorite because I get to learn & experience the culture of several new places in one trip! My ultimate cruise would be on the Mediterranean. One day I will! I appreciate balanced content. You still post primarily about your personal style, with bits of other topics here and there. So I find your blog to have a good blend of focused yet diversified enough content. I think it is because the diverse topics are still related; you've posted about your lifestyle in the past, and how it impacts your personal style. Maybe the tip was trying to call out/should have called out rather the other extreme of posting about many completely unrelated topics? A blog like that would in fact probably not capture my continued interest for very long. But then again it depends on the expectation that the writer sets for the audience; what does the writer say (via the blog name, in the "About me" section, etc.) that you can expect to see on the blog? And does the writer frequently deviate from that?